[SatNews] The Air Force concluded a six-month rigorous and complex multiservice operational test and evaluation of its Advanced Extremely High Frequency (AEHF)system in January at Schriever Air Force Base, Colorado. The test and evaluation's goal was to ensure the AEHF system performed its missions the way it was designed -to provide survivable, global, secure, protected and jam-resistant communications for military ground, sea and air assets. 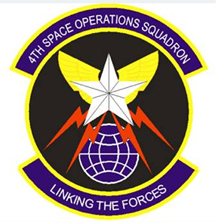 The Air Force Operational Test and Evaluation Center Detachment 4 at Peterson Air Force Base, Colorado, partnered with the 4th Space Operations Squadron, which is responsible for the command and control of the system, as well as other Air Force, Army, Navy and Marine units. "In the event that we go into a nuclear war, we have to make sure a communication link for Department of Defense components and national leadership is available during a contested environment," said Maj. Matthew Collins, AFOTEC Det. 4 AEHF test director. "And (AEHF) is a system that is capable of providing that connectivity." Airmen resolve satellite anomalies from their advanced ground mobile units January 13, 2015, at Schriever Air Force Base, Colorado. The squadron is responsible for command and control of the Milstar/Advanced Extremely High Frequency satellite constellation. The Air Force concluded a six-month rigorous and complex multiservice operational test and evaluation of its AEHF system in January. The Airmen are assigned to the 4th Space Operations Squadron. U.S. Air Force photo/Staff Sgt. Julius Delos Reyes. To ensure AEHF meets its mission, the team laid out test and evaluation objectives—validate the AEHF's advanced ground mobile unit, validate the system's integration to the legacy Milstar constellation, confirm its communication capability for the end-users and ensure the system can operate in a nuclear environment. In order to validate its advanced ground mobile units, 4th SOPS simulated a deployment of its ground mobile assets to make it easier for personnel and to save time and money. The squadron members operated the satellite constellation from the mobile systems instead of from the squadron's normal control center in the Integrated Operations Environment. "If for some reason, we need to go out and operate the satellites because we can't do it here at Schriever because of a threat, a war or any incident, then we go operate out of our mobile units," said Lt. Col. Zachary Owen, the 4th SOPS director of operations. "The piece of this testing was to make sure we can operate out of those mobile units for an extended period of time." Since 4 SOPS has a unique ability to operate its satellites using two control systems, it allowed the mobile units to operate the satellites using its dedicated system, which is the AEHF Satellite Mission Control Subsystem. For the duration of the test, 4th SOPS maximized its use of the mobile ASMCS capability and minimized its operations from the IOE; though 4th SOPS kept a presence in the IOE for command and control of the day-to-day operational mission. "In the mobile unit, we had command and telemetry of the system so we could see the health of the satellites at all times," said Capt. Michael Meoli, the 4th SOPS Mobile Operations Flight commander. "We had an active command role in the mobile unit, while the IOE had passive telemetry; meaning, they could see the state of health of the system but could not command it." 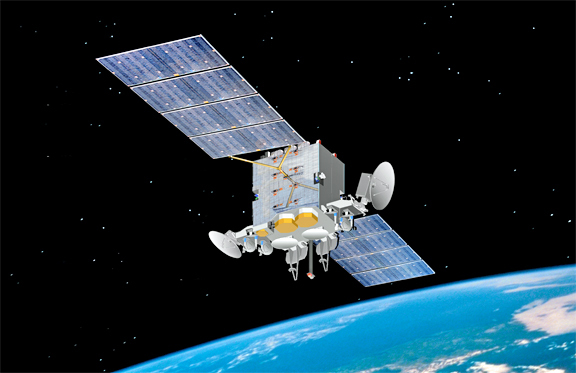 Artistic rendition of AEHF. Image courtesy of the USAF's Space & Missile Systems Center. The test also had to ensure the satellites' unique capability of operating autonomously during its transition period from IOE operations into the mobile units. "Basically, our satellites can still provide communication to users so there is no interruption of service," Meoli said. "It gives us a certain amount of time to deploy the mobile unit, and have it ready and operational." AEHF also has to prove its ability to integrate with Milstar, which is the legacy constellation of the protected Military Satellite Communication systems. The first Milstar satellite was launched in 1994 and is still operational. The Air Force launched its first AEHF satellite in 2010; which is the follow-on satellite to Milstar. "One AEHF satellite has 10 times the capacity of the entire Milstar constellation," Owen said. "We operate them as one constellation instead of two separate systems." There are now enough AEHF satellites on orbit to allow effective testing of the constellation, and its dedicated ground system, the ASMCS, to see how well those AEHF satellites and their command and control systems integrate with legacy constellations. "We conducted more than 250 tests in the IOE," said Capt. Aaron Doyle, a 4th SOPS mobile engineer. "Some of the tests were conducting table uploads, where you run everything on the satellite. We want to see if we can upload it to the ASMCS, change something around, then upload those changes to the satellite, and have it do a download from the satellite with that same information." The table uploads deliver software updates to satellite so 4th SOPS operators can make adjustments to the satellite's various systems and provide assistance to distant-end users. "This way you could adjust the settings so you could optimize the satellites for users worldwide," Owen said. The multiservice test also evaluated the AEHF's secure network. 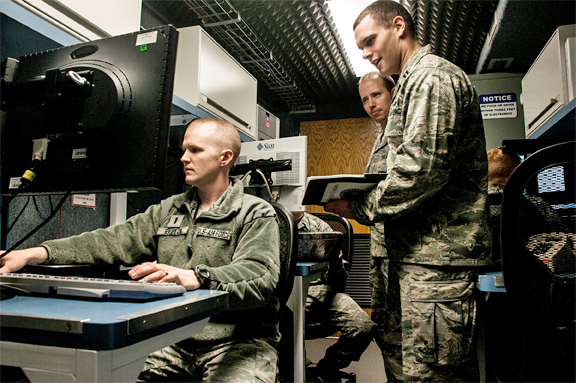 AFOTEC enlisted the 177th Information Aggressor Squadron and 92nd Information Operation Squadron to conduct a full up operational cybersecurity assessment. "They came up with a very comprehensive evaluation of 4th SOPS's network security," Collins said. The cybersecurity assessment is a very high DOD interest item, he said. As part of the evaluation, a team came out and probed the network to check on the security of the system, Owen said. "They tried to break in, for lack of a better term; they came and acted as bad guys," he said. The teams were very impressed with the network's security architecture, and the procedures in place to ensure it is protected from insider and outsider threats. Since the AEHF serves not only the Air Force, but other services as well, the test also looked at how the customers—Air Force, Army, Navy, Marines and international partners—use the system. "We have to make sure that AEHF can provide combat effects to the warfighters so they can accomplish their mission," Collins said. AFOTEC deployed personnel to two Navy destroyers and two submarines, three Army locations, two Marine sites and multiple U.S. Strategic Command locations. The test also included international partners, such as the United Kingdom, Canada and the Netherlands. "It was a huge test," Collins said. "Overall, it has taken about six months. We tested a total of 38 GSUs (geographically separated units). It was an expansive and rigorous test." During the evaluation, AFOTEC ensured the test was as realistic as possible in an operational environment, he said. Another important test for the AEHF system is to ensure it can provide protected communication, even during a nuclear environment. "For the first time ever, we tested the nuller and scintillation capability of the satellites in an operationally realistic environment," Collins said. "It is the unique capability of the satellites to be able to operate in a contested environment." The team partnered with outside agencies to provide a realistic scenario mirroring a contested environment, he said. Though the test has concluded, AFOTEC will still analyze the data gathered to determine if the AEHF system is performing its mission vital to national security. "Once AFOTEC is done with the report, the Air Force Space Command leadership will decide whether the AEHF system has reached initial operation capability," Owen said. "This is a big deal." Reaching that capability will allow for more operational users, he said. With a rigorous, end-to-end test like this, Collins reiterated the importance of teamwork not only at 4th SOPS but with other organizations as well. "One of the most successful things in this whole test process has been the coordination and teamwork between all entities involved," he said. "We coordinated with the program office, headquarters Air Force Space Command, contractors, private organizations, combatant commands, international partners, Air Force, Army, Navy and Marines, and the only way it worked was through the active collaboration of all those entities to focus on mission success to deliver the most capable next generation of protected satellite communications to the 50th Space Wing and our warfighters world- wide. According to senior leadership at the Space and Missile Systems Center, the success of the AEHF program is what they want to see in all other space programs. This is the benchmark for all future space acquisition programs."